In the Srimad Bhagavatam a distinction between ‘Religion Pretentious’ and ‘Religion Real’ has been clearly made. According to this original and genuine commentation of the Vedanta-sutra, there are a number of pretentious religious faiths which pass on by that name but actually there is nothing in essence which can be accepted as real religion. Real religion is the natural inborn quality of the living being and pretentious religion is an artificial nescience covering of the living entities’ pure consciousness effected under certain unfavourable conditions. Real religion remains in dormant condition when artificial religion dominates over the mental plane. The dormant religion is awakened by hearing in pure heart. But the inborn quality is never killed. For example, it is sometimes experienced that a person professing a particular faith of mundane religiosity changes his own and embraces another kind of religious faith. In India many such changes have taken place in the social life in different circumstances. During the Mohammedan rule in India many Hindus changed their faith in ‘Hinduism’ and embraced Islamism on account of many circumstantial pressures. Later on many such Hindus and Mohammedans changed again into Christian faith and so on. There are many educated gentlemen who profess practically no particular faith of religiosity and yet they are passing on under the shadow of a certain type of religious faith. All these different circumstances prove it definitely that professing a particular faith of religiosity is completely different from the natural inborn religious quality of the living being. What is the inborn quality of the living being? Let us first of all understand the nature of inborn quality. We can understand the inborn quality of the five elements. The inborn quality of earth is solidity. The inborn quality of water is liquidity. The inborn quality of fire is burning heat and light. The inborn quality of air is mobile humidity. The inborn quality of ether is all-pervading entity. The inborn quality of mind is determination and rejection. The inborn quality of intelligence is thinking and feeling and the inborn quality of ego is identification of Existence. That is the idea of sincere religious prayer. One must know himself as the spiritual entity eternal associate of the Supreme Lord. Somehow or other he is now thrown into the ocean of material existence where there is a perpetual hard struggle for existence to get rid of the disease of birth and death. Treatment for disease is accepted in order to get a temporary relief from the cruel hands of death. Why there is such vast arrangement of Health service both by the government and the public also? (1) The pains of birth. (2) The pains of death. (4) The pains of diseases. As such, unqualified path of religiosity is that which can bring in real relief to the above invincible sources of pains so much unwanted by the human society. The goal of religious path is therefore to achieve the status of relief from pains. The path of religion which does not offer this highest benefit to the mankind is certainly a pretentious religion and Srimad Bhagavatam deprecates such process of religiosity as a matter of cheating the public. Srimad Bhagavatam begins therefore its real form of religion in the following manner. (1) The path of fruitive work. (2) The path of culturing knowledge and mystic powers. (3) And the path of devotional service and worship. (1) The path of fruitive work, karma-kanda, because under the cover of religious ceremonies and with the purpose of elevating one’s material conditions, are all cheating process because they can never reach to the highest status of relief from the material existence. As mentioned herein before, the living entity is perpetually struggling hard to get rid of the pangs of material existence because he wants the supreme relief from material pains. The path of fruitive work leads one either to happiness or to distress of the material existence. By pious fruitive work one is placed in the position of temporary material feelings of happiness whereas acts of vices lead one to the distressful position of material wants and scarcity. Even if one is put into the most perfect order of material happiness, one is not able by that way to become free from the pains of material existence as birth, death, old age and diseases. The materially happy person is therefore in need of the eternal relief which the path of religiosity of fruitive work can never award to such religionist. (2) The path of culturing knowledge known as jnana-marga and that of mystic powers known as yoga-marga are equally hazardous and nobody knows where he is going by culturing such uncertain procedures. The empiric philosophers in search of spiritual knowledge may endeavour by mental speculations most laboriously for many, many births but unless and until he reaches to the stage of the purest form of the quality of goodness or until he has transcended the plane of material speculation, it is not possible for him to know everything emanating from the Personality of Godhead Vasudeva. His attachment to the impersonal feature of the Supreme Lord makes him unfit to rise up to that transcendental stage of Vasudeva and therefore due to his unclean state of mind he glides down again into the material existence even after an ascendance to the highest stage of liberation. This fall down is made possible due to his want of locus-standi in the service of the Supreme Lord. And so far as the mystic powers of the ‘yogins’ are concerned, they are still more full of juggleries in the path of spiritual realisation. One German scholar who became a devotee of Godhead in India said that so far mystic powers of the ‘yogins’’ are concerned, the German scientists have made laudable progress by the aid of material science. He therefore came in India not to learn the method of Yogi’s mystic powers solved by material science but what he needed most was to learn the path of transcendental loving service of the Supreme Lord mentioned in the great scripture of Bhagavatam. The mystic powers of the ‘‘yogins’ make the student materially powerful for a temporary relief as much as other material science can give. But such mystic powers can never be the permanent source of relief from the abovementioned four items and therefore according to the Bhagavata school, this path of religiosity is also a method of cheating the followers. In the Bhagavad-gita, it is therefore clearly defined that the highest mystic powerful yogi is the one who can constantly think of the Supreme Lord within his heart engaged in the loving service of the Lord. (3) And the path of worship of the innumerable devas or administrative gods is still more hazardous and uncertain than the abovementioned two items of karma-kanda and jnana-kanda. This system of worshipping many gods such as Durga, Siva, Ganesa, Surya or impersonal Vishnu is accepted by persons who have been made blind by the intense desire of sense gratification. Worship of gods, as above mentioned, when it is properly made in terms of the rites mentioned in the sastras which is now very difficult to prosecute in this age of want and scarcity, can certainly fulfill the intense desire of sense gratification, but the success obtained by such methods is certainly very transient and befitting a person of poor fund of brain substance. 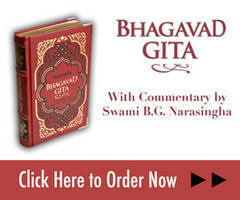 That is the verdict of Bhagavad-gita. No sane man should be satisfied by such temporary benefit, driven by a sense of enjoying this material world. None of the above mentioned three methods of religious path can deliver a person from the law of material existence called the threefold miseries. But the process of religiosity as mentioned in the Bhagavatam is able to give permanent relief to the followers from the laws of threefold miseries. Herein the highest standard of religious form is described by which one can be reinstated in his original position of transcendental loving service to the Supreme Lord. Loving service of the Supreme Lord is free from the infection of sense gratificatory desires, fruitive work or culture of knowledge-seeking merging in the Absolute to become one (?) with the Supreme Lord. All such methods are pretentious religiosities because they are unable to give perfectual relief to the followers. The word projjhita is significant. Pra means complete and ujjhita means reject. Any process of religiosity based on sense gratifications gross or subtle must be accepted as one of the pretentious religions. The process of religiosity in the shape of fruitive work is directly a method of gross sense gratification while the process of culturing spiritual knowledge with a view to merge in the Absolute is a method of subtle desire of sense gratification by becoming one with the Absolute. 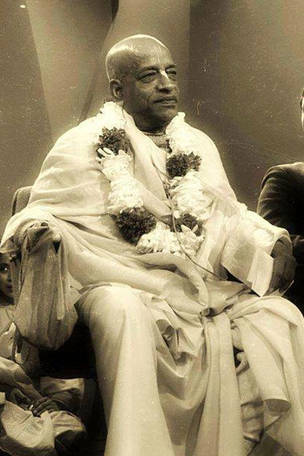 Therefore all such sense-gratificatory methods of pretentious religiosities including the path of culturing knowledge to become one with the Supreme or the idea of liberation and everything like that are completely rejected in the process of bhagavata-dharma, or the transcendental process of religion the inborn quality of the living being. The bhagavata-dharma or the religious principles described in the bhagavata of which the preliminary study is The Bhagavad-gita is meant for the liberated persons of the highest order who give very little value to such sense-gratificatory pretentious religiosities. The fruitive worker or the elevationist and the empiric philosopher or the Salvationist all of them want to raise their material position first and foremost but the devotees of Godhead have no such desire for themselves. They serve the Supreme Lord for His satisfaction only. Sri Arjuna at first decided not to fight and wanted to satisfy his senses by becoming a so-called non-violent pious man but when he was fully situated in the principles of bhagavata-dharma culminating in complete surrender unto the will of the Supreme Lord, he changed his decision and agreed to fight for the satisfaction of the Lord. He said like this. Anything that hampers this unadulterated spiritual position of the living being must be taken therefore as the process of pretentious religion. Real form of religion is spontaneous loving service of Godhead. This relation of the living being with the Absolute Personality of Godhead is eternal. The Absolute Personality of Godhead is described as the vastu or the ‘Substance’ and the living entities are described as the vastavas or the innumerable samples of the ‘Substance’ in relative existence. This relation of the Substantive with the ‘Substance’ can never be annihilated as it is in the case of inborn quality. By contact with material nature, the ‘substantive’ living entities may exhibit varied symptoms of the material disease but to cure this material disease is the supreme object of human life. The process which helps such treatment is called by the name as bhagavata-dharma, sanatana-dharma or the Religion Real. We shall try to describe the form of real religion in the pages of "Back to Godhead."